The year is 1837, and a new Queen sits on Great Britain’s throne. Victoria will soon become the primary influence on wedding customs in Europe and America and will remain so for the next 75 years. The years of her long reign will eventually be categorized into three distinct fashion periods, the first of which is marked by the illustrious wedding of the Queen to her beloved Albert. Though many customs endured throughout the 1800s, details like wedding party attire, colors and decorations, venues, and jewelry changed with the passing of each decade. The Early Victorian Era is best known for ostentatious and romantic flourishes in everything from literature to fashion and jewelry design. Wedding customs were no exception. Drawing from some of the enduring traditions of the late Georgian Era, as well as from some of the new elements introduced by Queen Victoria during her wedding to Prince Albert in 1840. During these first years of Victoria’s reign, weddings would slowly adopt the elements she included in her Royal Wedding. During the 1840s, six o’clock in the evening was the customary time for private royal weddings. Thinking always of her adoring subjects (or perhaps wisely taking her Prime Minister’s advice), Queen Victoria decided upon a very public ceremony to begin at noon. English law dictated that non-royal weddings were to be held only in the morning, often commencing just before noon in the bride’s parish church. The wedding party would then retire directly afterwards to the home of the bride’s parents for the commencement of the customary wedding breakfast. Queen Victoria and Prince Albert did the same, albeit on a very grand scale. Their wedding breakfast took place at Buckingham Palace, where her mother did indeed reside. Of course, the most important Early Victorian wedding detail was the wedding dress, followed in importance by the groom’s attire and the attire of their attendants. The trend toward all-white weddings was in the making, though it would be some time before white wedding dresses would become fashionable. It began with Queen Victoria’s decision to depart form the customary Royal silver for her gown. It was further established in the late 1850s, when Queen Victoria insisted that the next two Royal brides (Princess Alexandra and Princess Alice) follow her lead and wear a white silk gown from Spitalfields with white Honiton lace and white orange blossoms. The Queen's insistence on white wedding dresses for her royal progeny were rooted in her mourning and hopeless romanticism. Always trying to both avoid and recreate her happiest moments with Albert, she used her son and daughter's wedding to relive her own wedding. Her second reason was rooted in her love of Charles Dickens and her over-identification with the poor and downtrodden. Since her wedding in 1840, she used every opportunity to revive two downtrodden areas of London, Spitalfields and Beer. Her insistence on white Spitalfields satin and Honiton lace from Beer would supply these communities with work and income for months. Since white fabric was harder to come by and was fairly impractical for most Early Victorian ladies, who could not afford to wear a dress only once, it would take a couple of decades for white wedding gowns to become the norm. For this reason, many early 1800s brides wore blue, soft green, cream, or ivory dresses. Some colonial brides ever wore brown or black gowns. The blue wedding dress was a holdover from Georgian Era traditions, when blue stood as the symbol of purity. These gowns, simple and without much embellishment, were worn later for daily wear or for Court presentation. Depending on the resources available to the bride and her family, the dress might have been made of organdy, linen, silk, or cashmere, and it may have included tulle, gauze, or lace to accentuate the hemlines, shoulders, collar, and/or sleeves. No matter which materials were chosen, the Early Victorian wedding dress consisted of a form-fitting bodice with its trim waistline tucked into a full flowing skirt worn over hoops and petticoats. To complete the effect, the early-18th century bride wore embroidered white silk stockings and ballet-like slippers made of white satin, brocade, or white kid with ribbons at the instep for securing to the ankles. In her gloved hands, she carried a white handkerchief embroidered with her prenuptial initials and a beautiful bouquet of garden herbs and flowers, such as roses or peonies, giving way toward the end of the period to white orange blossoms. Over her coiffed hair, the bride, all dressed in white, would wear a white wreath of flowers, most likely orange blossoms by the end of the period. An attendant would attach her veil to the back of this garland of flowers. Her veil would have been long and white, made from a thin gauzy material such as gauze, sheer cotton, or Brussels lace (later Honiton lace). Though in 1840 Queen Victoria broke with tradition and chose a waist-length veil, most brides in the early 1800s wore full-length veils which trailed behind them like an angelic cloud. In some Victorian portraits, the veil appears to create the appearance of a gauzy booth where the bride hides away until her maturity is made complete by the exchanging of the vows. At this time, the veil was worn as a coronet around the bride’s head and shoulders, cascading down her back, not covering her face. After the ceremony, many brides converted their veil to a shawl which they most likely wore during the wedding breakfast. “77 Interesting Facts About…Weddings.” Random Facts, last updated December 23, 2009. Accessed January 13, 2013. http://facts.randomhistory.com/interesting-facts-about-weddings. Bridal Whimsy. “The History of Wedding Traditions.” Bride & Groom, accessed January 13, 2013. http://www.brideandgroom.com/wedding-articles/wedding-traditions-2.asp. Dreamstress Blog, The. “Queen Victoria’s wedding dress: the one that started it all.” April 18, 2011. http://thedreamstress.com/2011/04/queen-victorias-wedding-dress-the-one-that-started-it-all/. “Elegance of a Victorian Wedding, Part I, The.” Hudson Valley Weddings, accessed January 13, 2013. http://www.hudsonvalleyweddings.com/guide/victorian1.htm. “Elegance of a Victorian Wedding, Part II, The.” Hudson Valley Weddings, accessed January 13, 2013. http://www.hudsonvalleyweddings.com/guide/victorian2.htm. Hoppe, M. “The Victorian Wedding.” Literary Liaisons, accessed January 13, 2013. http://www.literary-liaisons.com/article003.html. Micarelli, Allison. “Wedding Style: A Victorian Event.” The Knot, accessed January 13, 2013. http://wedding.theknot.com/wedding-themes/choosing-wedding-themes/articles/a-victorian-wedding-event.aspx. Stajda, Sharon. 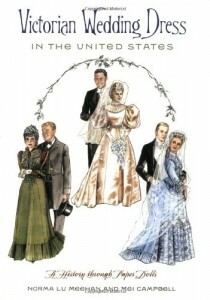 “Wedding Traditions & Customs—Historical Wedding Fashions – 1850- 1950.” Squidoo, last modified January 24, 2013. http://www.squidoo.com/weddingtraditions. “Victorian Days: I Thee Wed.” Angelpig.net, accessed January 13, 2013. http://www.angelpig.net/victorian/ceremony.html. “Victorian Wedding, The.” Victoria’s Past, accessed January 13, 2013. http://www.victoriaspast.com/VictorianWedding2/bride.htm. “Victorian Wedding Traditions.” World Wedding Traditions, accessed January 13, 2013. http://www.worldweddingtraditions.com/ethnic_wedding_traditions/victorian_traditions.html. Ziegenfuss, Jen. “Marriage in the Victorian Era.” University of Florida, accessed January 13, 2013. http://www.clas.ufl.edu/users/agunn/teaching/enl3251/vf/pres/ziegenfuss.htm.